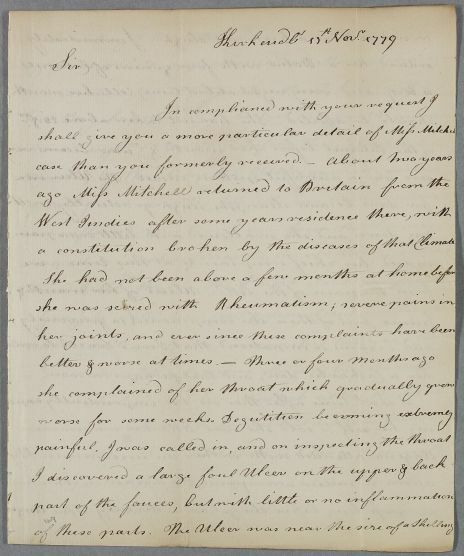 Letter from John Walker, in response to Cullen's request for more information, giving a more detailed account of the case of Miss Mitchell. Her health was undermined in the West Indies from where she returned two years previously. She has rheumatic pains, angina, and a long-standing throat condition which is described variously as a tumour on the tonsil or a quinsy, which makes swallowing difficult. She is now weak and emaciated because of her difficulty in swallowing. She has been treated with mercury. Walker asks if it may be 'the Sibbins'. 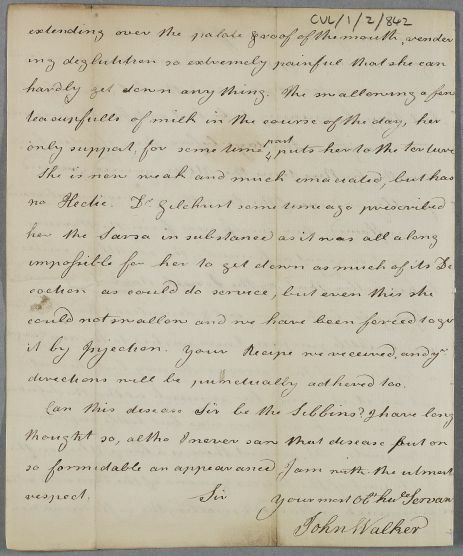 Summary Letter from John Walker, in response to Cullen's request for more information, giving a more detailed account of the case of Miss Mitchell. 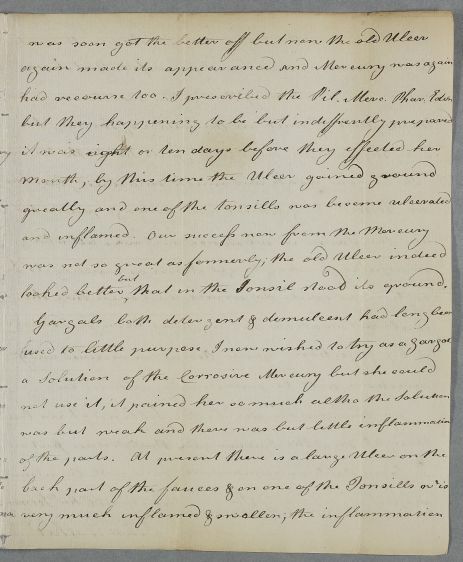 Her health was undermined in the West Indies from where she returned two years previously. She has rheumatic pains, angina, and a long-standing throat condition which is described variously as a tumour on the tonsil or a quinsy, which makes swallowing difficult. She is now weak and emaciated because of her difficulty in swallowing. She has been treated with mercury. Walker asks if it may be 'the Sibbins'. 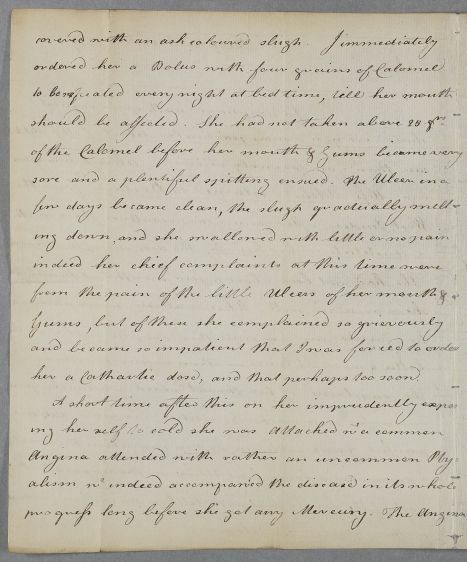 Case of Miss Mitchell whose health was undermined in the West Indies from where she returned two years previously; she has rheumatic pains and a long-standing throat condition which is described variously as a tumour or quinsy. her a Cathartic dose, and that perhaps too soon. looked better, ↑but↑ that in the tonsil stood its ground. directions will be punctually adhered too. should be affected. She had not taken above 25 gns. had recourse too. I prescribed the Pil. Merc. Pharm. Edin.